BROSSARD, Que. - Big Plastic is laying down the legal gauntlet against a Montreal suburb that is looking at banning plastic bags this year. 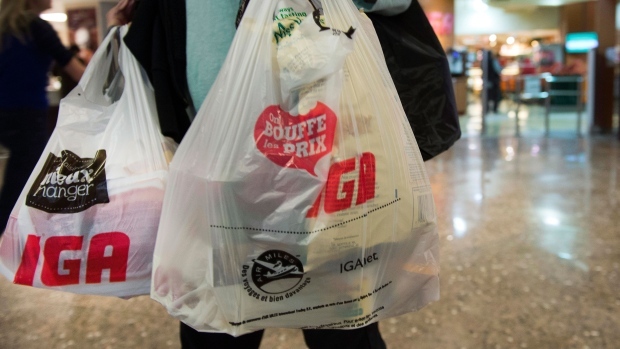 The Canadian Plastic Bag Association has served the City of Brossard with a legal letter demanding it put a stop to its shopping-bag bylaw. The suburban enclave just south of Montreal is hoping to pass a bylaw next week that would see a ban on thin, disposable plastic bags come into effect in September. Municipal lawmakers cite environmental and economic reasons for the proposed law, which is expected to pass at a meeting on Feb. 16. But the association says the bylaw is "abusive and unreasonable"
And the province's retail council says the city should discuss the matter with stakeholders before unilaterally passing such a law.